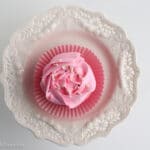 You won’t need candles to bring the romance for your Valentine’s dinner, just serve Pink Champagne Cupcakes with Pink Champagne Buttercream with a glass of Brut Pink Champagne, of course. Preheat oven to 325° if you are using a dark metal cupcake tin or 350° if you are using another type of cupcake tin. Using a mixer or a stand mixer, combine cake mix, and oil. Add Champagne, and egg whites and beat on medium speed for 2-5 minutes. Line cupcake tin with cupcake papers. Fill each cupcake liner with batter halfway. Using a mixer or in a stand mixer, mix together butter and Champagne on medium. With mixer still running at medium speed, add sugar 1/2 cup at a time. Continue to mix for 3-4 minutes until fully combined and fluffy and smooth. Use an ice cream scoop to fill the cupcake liners so all of your cupcakes are the same size. Fill the cupcake liners halfway. Test doneness using a toothpick. If it comes out clean, the cupcakes are done. Make the cupcakes a day before you frost them to ensure they are fully cooled.